Broadcasting in front of a live studio audience from their swanky NYC apartment, meet late night's newest talk show hosts, Mr. Peabody (R) and Sherman. Catch them in the all-new original series "The Mr. Peabody & Sherman Show," debuting exclusively on Netflix October 9. 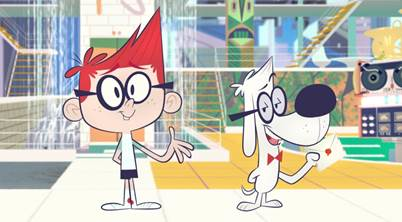 From DreamWorks Animation Television comes an all-new original series—THE MR. PEABODY & SHERMAN SHOW—starring Chris Parnell (Saturday Night Live, 30 Rock, Rick & Morty) as Mr. Peabody and Max Charles (The Amazing Spider-Man, The Strain) as Sherman.